Lowers pour point temperature of fuel upto 40° F; lowers the freeze point of water in fuel. Disperses wax crystals and water. Cleans and lubricates fuel system, helps to remove deposits, prevents rust and corrosion. Stabilizes fuel to prevent break-down, improves power and economy and reduces emissions. A more economical alternative to Stanadyne Performance. Cleans and lubricates fuel system, helps to remove deposits, prevents rust and corrosion. Stabilizes fuel to prevent break-down. 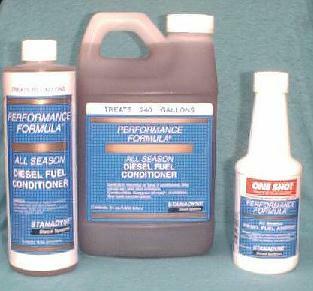 Use periodically for fuel system maintenance in warm seasons. Diesel Fuel Additive--Extra strength lubricant and cleaner. 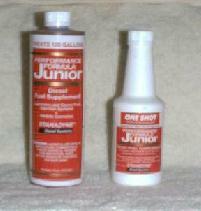 Cleans and lubrcates injectors, prevents rust and corrosion, disperses water. Contains no alcohol. For use in fuels with poor lubricating properties, or to prevent dry-injector scoring after injector service/replacement. Originally intended to counter the effects of silicone sealer by supplimenting the antifoaming agents present in API CF-4/CG-4 oils. This can also be used when antifoaming agents are suspected of being depleted resulting in lost preformance, or to temporarily extend oil change interval until the oil can be changed (such as on a trip). Not intended as an alternative to oil and filter changes. Compatible with Amsoil products. DCA4 conditioner to prevent cylinder wall deterioration from coolant cavitation. Add eight ounces per gallon coolant capacity during drain/refill (two pints); boost at 15,000 miles with 8 ounces. Tests strength of SCA/DCA4 (molybdate/nitrite) in green antifreeze. Add conditioner only when required. Tests for nitrite loss in gold antifreeze, or nitrite contamination in red antifreeze. Shows freeze point of coolant. Tests freeze point and relative alkalinity (RA) of red extended life coolants (ELC) or Ford's Specialty Orange antifreeze. 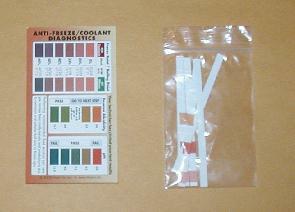 Tests pH level. 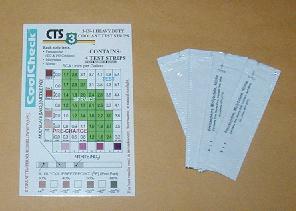 To check for nitrite contamination, use CTS-3 strips. 1550 strips may also be used to check freeze point and pH in green or gold antifreeze. All prices are US dollars and DO NOT include shipping and handling.